The producer's Toolbox - Lesson 1: Guitar layering - example over a Pop/Rock production. - Producer, Musician, Artist. I want to talk about a bit on guitar layering, as it is a very common thing when recording this intrument, where you hear a section with ''one big guitar'', there is a high chance it is actually composed of various tracks doing the same thing or very similar playing to build it up to the desired effect. Sometimes with more than one guitar or amp. I recorded guitars for Stanley Parker's album, which I am sharing at the end of the post but I'm separating a little section where I layered quite a lot of guitars, 6 guitars, to get that effect of a big rock section, kind of a Foo fighters nod to it. So, here is the particular section before I recorded anything on top of it . So , just drums , acoustics , some reference vocals and a very subtle keyboard layer . I was asked to bring in some more rock element to the whole song , so I added a lot of crunch electric guitars to give that desired effect. See how the character changed? though the essence of the song is the same, this added that rock bite that we were looking for. There are 6 guitar tracks there, and I actually used 3 different guitars to add to the ''big dimension'' effect. 1. Choosing the Gear This is quite important, choosing the correct equipment is important, as they are ''sound tools'', choosing the correct guitar and amp will help us get closer to the desired effect. It might be a ''bad choice'' to use a BC Rich on a Randall for a jazz section or a vintage telecaster and a fender amp for a Metal section, you get the idea. Even if you have 1 guitar and one amp, choosing the correct EQ settings and plug-ins might help us get closer to what we need. Epiphone AJ-220SCE - A very affordable acoustic but a true workhose, I've brought this guitar in to more sessions than anything else and it always makes it to the final take. Maybe I got lucky but I get very good results with this guitar so it's a keeper . 72' Thinline Tele - Made in Mexico, changed the original neck for a strat one and it has stayed that way ever since, pickups and electronics are stock. Tribe Detroit Custom - Quite an interesting guitar as it is made from steel. For me it is like an electric dobro. It is very bright sounding and I use it for anything I need to cut through in the mix. Suhr Custom Classic S - Modern guitar, vintage strat tones, also the only guitar I have with the tremolo set-up. Cordovez Strat Prototype - My main guitar for many years, built by my two brothers, it has it's own character and it's where I feel most comfortable. Guitar --> Maxon SD-9 --> Vox Ac 15 . For a microphone I used an old and trusty Shure Sm57. It is important to define how many layers you are going to add, since it will affect dramatically on how you should approach the ''build-up''. In this particular part since I am using 6 tracks, it was definitely going to be a situation in where I had to play small chord voicings and alter them a little from track to track in order to create this big section without being a complete mess of notes and frequencies. It wouldn't make any sense to have 6 guitars doing the same thing with big open chords. If we were doing a more ''organic'' session with less track layering I would have changed the approach completely. It is important to have that in mind as the results will be different. Here I separated each guitar track so you can see how I did subtle variations on each part, inverting the chord, changing the guitar, playing in different sections on the guitar, etc. Finally, I did two ''cascading'' examples with the guitars getting added one at a time . One going from guitar 1 to 6 and viceversa so you feel how they add up with each other. *Go easy with the gain! don't over distort your tracks as the harmonic content will also add up and it will get messy. Also important, having 6 centered guitars doesn't make sense so it's important to sit them correctly in the mix. Even though I don't mix my tracks I do write extra indications on each track. For example, a guitar track might be named : '' Crunch rhythm telecaster 40%L '' giving some indications on where to pan it and such . 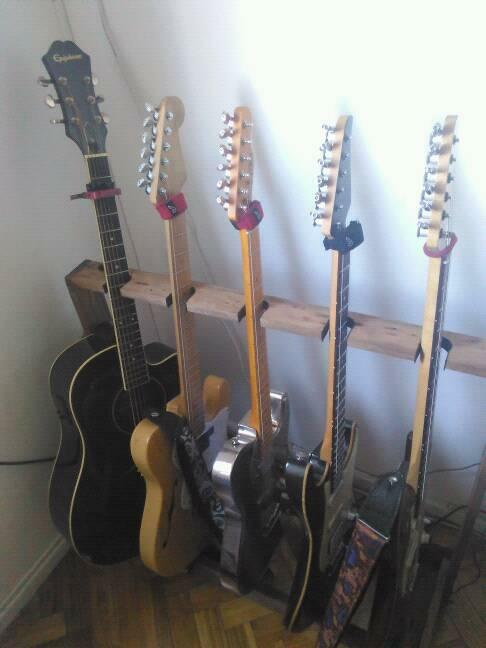 When I layer several guitars I usually try to place them like around an imaginary fan, just personal taste. 4. Don't get over attached! Don't get too attached to your arrangement and/or layering since in the whole picture it might not work. I tend to record more than needed and then clean up the tracks, whatever that doesn't add anything gets erased . You don't want to have 40 guitar tracks in one song! ( unless they are REALLY needed ) as mixing engineers will hate you ! Always double check, edit and ''clean up'' your sessions. Well, here is the final result, already mixed! Actually the whole layering thing became more of a subtle thing because it was mixed quite low as the acoustic is the main guitar , but it does add some extra ''punch'' to the whole picture! Can you spot the section? What do you think? Do you think it worked for the song? Can you spot all the guitar layers throughout the whole song? I hope this lesson gives you some ideas for your own recordings and how you can add up tracks to achieve a desired effect in the song! I'll be more than happy to answer any questions , let me know if you would like me to explain anything in better detail.